Last night I went to a karate slash pilates slash bootcamp-ish slash heart attack class. I know. Your face? Your expression you are wearing right now? I was thinking the exact same thing. But my face was red and dripping with beads of sweat. Anyway. That’s not the secret. All I could think of during this class was cheese. Cheese on toast, cheese with jam, cheese on nachos, cheese in my face. If you find this peculiar then you really don’t know me. If you are not the least bit surprised, well then… you sure are neat. And I like you. After flinging myself through the front door following my uncoordinated attempt at unarmed combat and eating four handfuls of peanut butter stuffed pretzels (I hear they are excellent for muscle recovery. write that down. ), it dawned on me that peanut butter pretzels do not a dinner make. I had already spent a luscious 30 minutes with a quesadilla earlier in the evening, but when you jump, kick and squeeze your body into oblivion, you deserve a second dinner. It’s like a law or something. Then I remembered the buffalo chicken mac sitting in the fridge and decided it qualified as a post-workout recovery meal. This is sort of like mac and cheese. Or it is mac and cheese. Can someone tell me what the difference between baked pasta and mac and cheese is? Educate me. It’s probably the cheese to pasta ratio. 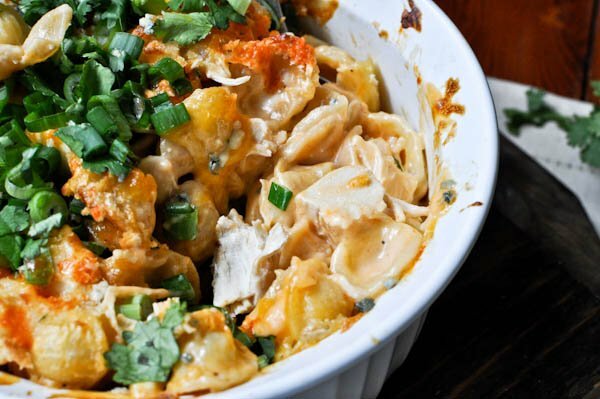 Copious amounts of cheese make up this buffalo chicken pasta. Maybe baked pasta doesn’t have lots of cheese. I don’t know. But guess what? Now it does. That’s the beauty of this whole little deal we’ve got going on. I make things and name them whatever the heck I want. Sometimes you call me on it. Other times you look at me with googly eyes. Most times it is still delicious. Except for anything with broccoli. If I ever tell you something with broccoli is delicious, I’m lying. I don’t care what you call it. Just get on it. Prepare water for pasta and cook according to directions. While pasta is cooking, heat a medium saucepan over medium heat. Add the butter, and once it’s melted and bubbly add the flour. Whisk together to create a roux and cook for 1-2 minutes until mixture gets a bit golden in color. Add milk, stir and turn down heat to low. Continue stirring until milk thickens. Add in grated cheeses and continue to stir until mixture is smooth. Stir in buffalo wing sauce. Taste and season with salt and pepper if needed. Spray a baking dish (9 x 13 is fine, I used a round 4-inch deep dish) with non-stick spray. Add pasta and chicken, then pour cheese sauce over and mix throughly until everything is coated. Sprinkle with additional grated cheese and bread crumbs. Bake for 25 minutes or until cheese is golden brown. Remove from oven and immediately top with gorgonzola, green onions and cilantro. Drizzle with buffalo wing sauce. And save me some? I’m still hungry. [almost] Wordless Wednesday: My Most Hated Chore. To all those who said they had trouble getting the milk to thicken, did you let it come to a bubble? Those ratios sounds about right to me, as we’ve used basically the same amounts for mac & cheese, cheese sauce for broccoli, or white sauce for years. But I do know now (thanks to Emeril, LOL) that it a roux won’t reach its full thickening capacity until it comes to a boil. No offense to anyone’s skills, just popped into my head. Would the cook time change if I used ramekins? I made this last night and it came out perfect! I used 1T butter, 1T flour and only 1 cup of milk to make the roux. I had no trouble getting the milk to thicken although it did take 15-20 mins. I used cheddar, asiago, and tossed in some leftover cream cheese. It was delicious, thanks for the recipe! WORST anything I have EVER cooked!!!!!! Followed the recipe exactly and the pasta was so dried out it was crunchy. How embarrassing!!! Will never try your web site again or any of your recipes!!!! Hamburger Helper is better than this! OMG, I cannot stress enough how bad this was. A total waster of ingredients!!!!! How hard is it to get the pasta tender? Lol you don’t even need this website to do so, not the recipe’s fault . Seriously, I cannot even fathom what you did to your pasta to make it “dried out” and “crunchy” ….besides not cooking it. I can’t figure out any reason for being this nasty to someone else about you being a bad cook. Perhaps your “embarrassment”? This has become my “are you kidding?” dish. I made it the first time, cut it in half and threw one casserole in the fridge for my bestie and her family. After my boyfriend ate all but my meager portion, I made the mistake of telling him there was another casserole in the fridge… The morning after, there wasn’t. He and his “we’re going to grab a beer” buddies polished it off. I almost hate to make this now because people suddenly start “dropping” by! This had become a regular at our house. We love it. I just had to share it on my own blog. Thanks for a great meal! To adapt, me and my boyfriend marinated the chicken in a BBQ sauce for an hour and then added some extra to the cheese sauce instrad od buffalo. It was delicious and I am going to continue my hunt for buffalo sauce!! Try looking for Frank’s in the condiment section of the store. I know that Costco usually carries it, as well. I used all sharp cheddar cheese and it was so gooooood. My brothers lost their minds. To say the least, it was a hit. This made our regular rotation of meals after my hubby took only a few bites. SCORE! The only change I’m going to try next time is either more sauce or tossing my chicken in sauce to coat before mixing in the noodles and sauce. We had a similar dish at a local restaurant and remembered the chicken being colored with the sauce…love that I can make this at home and monitor my own ingredients!! Omg!!! Made this with white beans and shredded summer squash, SO DELICIOUS. I’m freaking out over how amazing it is. I just used pepper jack, feta and cream cheese because that’s what I had- still amazing. You’re the best. Just made this for Sunday football watching and it was awesome. Your recipes never disappoint! I just made this last night for our football party. I was really expecting something with much more flavor. It was very one note.. I used a box of 13oz orecchiette and felt that it was way too much pasta to sauce ratio even though it was less than the pound you called for in the recipe. I ended up mixing in a half block of softened cream cheese just to give it some sort of creaminess that it was definitely lacking. I also ended up adding another 1/2 cup of buffalo sauce since it barely had any spice. I like the idea and appreciate you putting the recipe out there. But you know you can’t please everyone.